When it comes to protein, we have heard and perhaps believed one claim from two opposite spectrums. Either protein is life and nothing else matters or that we don’t need much protein at all. What is true is that protein is an essential nutrient and although we may not need massive amounts, we do need to be acquiring quality sources throughout our day. Protein is a core macronutrient that is essential for building a complete meal. For complete biological satisfaction, our meals and snacks should ideally contain a quality source of protein, fibre, and healthy fat. Protein is crucial for the building and maintenance of healthy bones, muscles, cartilage, skin, hair, hormones, and enzymes. There is no doubt that this macronutrient plays a huge role in our overall wellbeing. The good news is that getting a variety of quality in our diets is not as much of a stressor as it has become for some. Even adding some teeny tiny seeds such as hemp hearts to a dish can make all the difference. Over time (and especially thanks to pregnancy), I have mastered how to quickly and effortlessly get this important macronutrient included in my meals. Here are a few ways I like to add quality plant-based protein sources to my diet. 3 tablespoons of hulled hemp hearts carry a whopping 10g of protein. This superfood can easily be added to anything and everything as the flavour is so subtle. It is honestly my favourite way to get a great source of not only protein but healthy fats and fibre as well. I add them to my oatmeal, in my smoothies, to my pastas, and everything in between. I love sprinkling nuts and seeds on top of salads and any dish involving noodles. I also add nuts and seeds a lot into my baking. And let’s be real, we have no issues snacking on fruit and grains such as bread and crackers. Adding nut butter to these sources of fibre would not only add a source of protein but also adds a healthy fat making it a dream team snack. This is a yeast that grows on the ever so popular natural sweetener, molasses. After being harvested, washed, and heat dried (making it an inactive yeast), it becomes a savoury flake that has a cheesy and nutty flavour. Also known as “nooch,” nutritional yeast is a good source of vitamin B12 and protein (along with folic acid, selenium, and zinc). I use nooch just as often as I use hemp hearts because it can so easily be added to anything savoury. It is commonly used to make plant-based cheese substitutes but is also great sprinkled on top of soups, pastas, and steamed or roasted vegetables. It also makes for a great popcorn seasoning. Two tablespoons of this magic has 9g of protein. There are many different kind of sprouts and they all individually pack a nutritional punch. My favorite to use is alfalfa sprouts and I include them in wraps, sandwiches, and salads. I also like broccoli, radish, pea, and sunflower sprouts, especially to liven up a fresh salad bowl. Experiment with different kinds and get a variety. All sprouts have a significant amount of micronutrients but they also are a great source of plant-based protein. 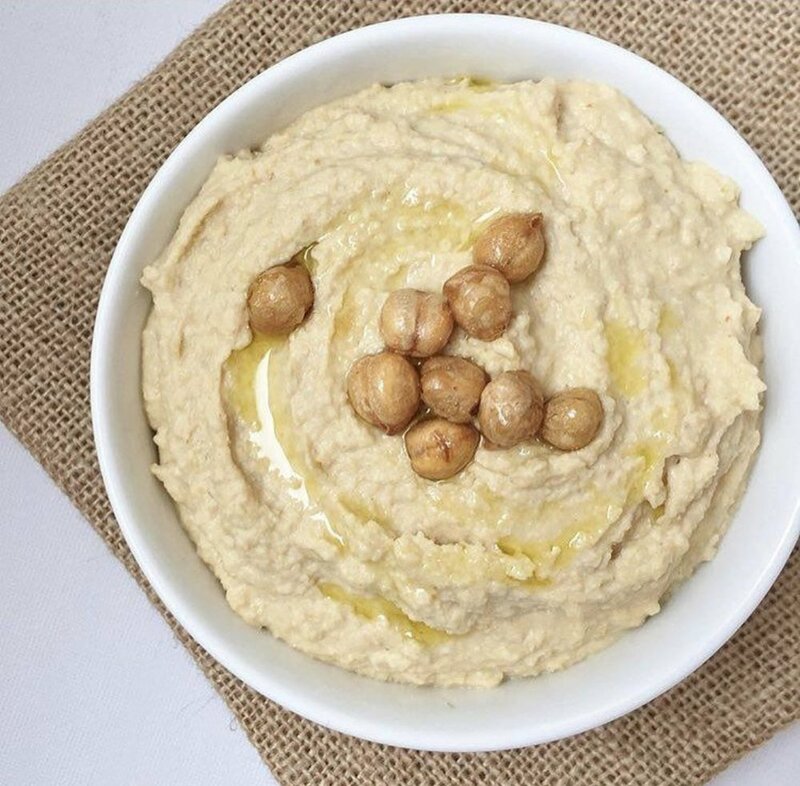 Hummus is such an underrated spread. It is so incredibly easy to make at home and it can go far beyond being used on veggie sticks and crackers. To quickly make a creamy and thick pasta dish, I will stir in hummus. It’s a great meal especially when served with tomatoes, onion, chopped leafy greens, and fresh herbs. I also regularly use hummus on homemade pizzas. I replace the traditional pizza sauce with a layer of hummus followed by a thin layer of salsa. It may sound strange but it is a game changer. Green veggies are loaded with magical health powers, including protein. It’s the last thing on people’s minds when it comes to considering protein but honestly, it all adds up. Adding some leafy greens to every meal can go such a long way. I also usually have some frozen organic peas and/or edamame beans steamed and ready to be used for some easy peasy meal enhancers.